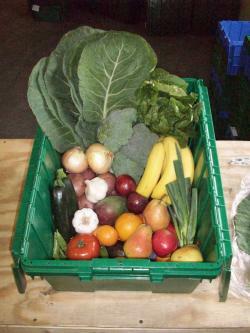 I thought about joining Boston Organics because they deliver farm fresh fruits and veggies straight to your door. There are also other CSA programs in the area too, but since I'm late in the game this year I don't know if I will be able to find a delivery one. Does anyone out there currently have a CSA or get weekly deliveries? How do you like it? And once I get that good-for-you produce home these Jayson Home & Garden farmers market baskets are perfect to keep them in. Much prettier (and greener) then the green plastic ones to keep on your counter or in the fridge. I figured I needed to write all this down because it holds me more accountable. Once I tell myself I am going to do something often times if I don't write it down or tell someone I forget or let myself slide when it doesn't get done. So now that I blogged about it- its out there in the open. 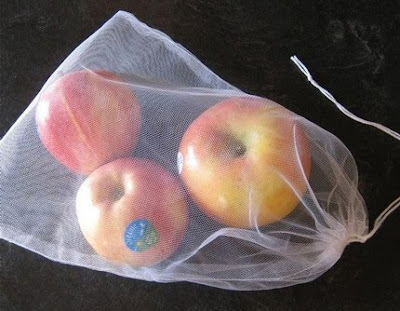 I have to, 1. buy more fresh, organic produce, 2. make some pretty reusable and good for the Earth produce bags and 3. make sure I register for some glass storage containers to replace all the gross plastic ones in my kitchen. I'm expecting you all to keep me on track now. Hi -I belong to a CSA and love it. This is our third year and we are a family of three. What I enjoy about it most is that I find myself pushing myself out of my cooking comfort zone in an effort to use up the produce. I know we eat better during the CSA season. I'm also confident I save money. Everytime I set foot in a market, I buy things not on the list. We also have milk delivery from an organic dairy and people immediately taste the difference. I love all your pledges to go green. Your glass round containers with the tops can double as small condiment bowls everyday and then you just throw the tops on for leftovers. I also think I do better with stuff in glass because I can see what I ever. You will have to let me know if you decide to go with a CSA. I also live Boston and have been giving it some consideration myself. I usually buy all of my produce from Whole Foods or Trader Joes (but beware of the one on Bolyston, it can be a mixed bag!) but it just gets so pricey. Keep us posted! YES! I need to have more fresh veggies and fruit in the house for my weight loss and health! I don't belong to any of those programs, but I am definitely a huge eater of fruits and veggies. (I just need to eat LESS of all the other crap, but I digress...) I try to eat organic when I can, but sometimes the "regular" stuff is more in line with my budget! Good luck with everything - and have fun registering!!! Right now, I have a server with 2 plates (one above the other) serving as a fruit stand on my counter. I'd say it's "green" because I'm using something I had (got when I got married!). I've also used wooden (like teak) bowls for fruit storage - they are great to have on hand for things like that and salads. I have a fun fruit bowl that I load up and then keep glass containters full of freshly washed and ready fruits and veggies- I have been a member on behalf of another member and love getting surprise fresh goodies. I will help to remind you to keep fresh items on hand and then you will be so happy! I have been thinking about joining the CSA. Let me know if you do. I signed up for Boston Organics for a few months last year. The produce was all great, but I ended up not being able to keep up with my box because I was just cooking for my boyfriend and I. We ended up throwing out a lot of the stuff that would go bad before I had the opportunity to cook with it. I did notice though that since I signed up, they have more options for the size and mix of selection now. And you can add things to a "do not like" list so you don't end up getting food you're not going to use. It definitely made me eat healthier, and since what you get is a suprise from week to week, it made for some fun cooking experiments! if you can't find organic you can also buy a veggie wash to use on conventional produce... good that you are decided to eat healthier! Good idea! Fresh produce is the way to go. We have a place called "Produce Junction" nearby. They sell both wholesale and, um, whatever the opposite of whole is (haha). However, the "normal" size items are still MASSIVE (i.e. 2 POUNDS of bananas). The good thing is that it forces me to buy lots of yummy (and healthy) fruits and veggies! So be sure to check out any wholesale produce places, farmers markets, and fruit/veggie stands for the best picks in produce! I have joined a CSA before - Brookfield Farm in Amherst when I was an undergrad. They deliver to Boston once a week but you have to sign up in November. I learned what a lot of obscure veggies were and what to do with them. There is a great farmer's market at Copley once a week if you are in the area. Been thinking about trying out fresh market delivery where I am...just worried I won't use it all in time. Let us know how you like it if you give it a try! Not only are you supporting local farmers, etc., but I find it also makes me a much more adventurous cook: if we get rutabega or turnips or something we've never prepared before, my boyfriend or I learn how to use it and make it so we like it. Our CSA drop-off is at the Channel Cafe (a fabulous little restaurant/bar/art gallery near South Station). What's great about the one we use is that they stretch their definition of "local" a bit, so it's a longer season and greater variety of produce. Can't remember their name at the moment, but can find out. They have flyers/sign-up sheets at the cafe, too. My neighbor joined Boston Organics and loves it! She couldn't stop raving about it when we were over for dinner, and we were able to sample some of the fruits and veggies. Very tasty and fresh! She's had a very good experience with their delivery service. You should join! I'm so excited you're into bringing more greens into your life. Come over and make green juice with me! I just joined a CSA this spring and had our first delivery yesterday... I'm excited for the challenge of cooking out of my comfort zone, but I think it will be more challenging than I thought! I'll keep you posted.... definitely a great way to eat healthy and support local farmers!! Great plan, I have friends who use a co-op, but they get to order exactly what they desire. I am wondering how wedding dress shopping went?!?! Boyfriend just came home with SO many greens last night!! His tip for making them last longer: sautee and refrigerate. My favorite is: make pesto; you can do it with anything leafy. Romaine pesto is yums.